I sooo want to come and live on your farm, what do you reckon? 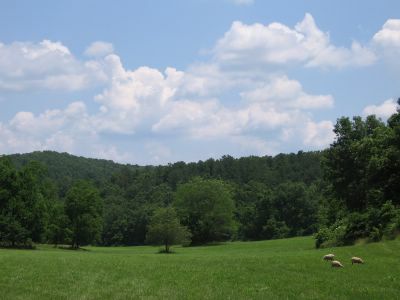 I think I want to come back as a sheep on FarmGirl's farm :) It's beautiful! I love all your pictures, but I have to say, this is one of the best so far. Look forward to the new posts every day! Thanks, FG! So green and with the woolly sheep makes it look like a perfect paradise. Quiet and peaceful. For now at least. A truly beautiful photo. You are blessed to be able to live in such surroundings. Hi Farmgirl, I saw your site on the Blogger list, and am very glad I paid a visit. Love your photos, they brighten up my work day! I must apologise for adulterating your Decidedly Different Chocolate Chip Cookie recipe, I made some today and substituted muesli and sultanas for choc chips, but they still turned out delicious!